Видеокурс АНГЛИЙСКОГО - Learning English (на 2 DVD-дисках) - 2 DVD-диска в бумажных конвертах. ЦЕНА указана за ВСЕ 2 диска. Внимание! Данный курс рассчитан на начальные знания языка и умение понимать речь на слух хотя бы в самых ограниченных пределах! Видеокурс рекомендуется для уровня Intermediate и выше. Are your English skills standing in the way of your success? Here is the way to improve your English thats quick and easy - and really works! 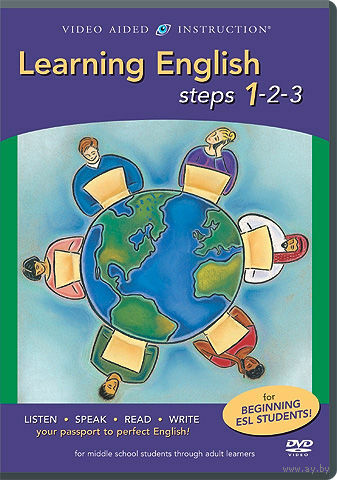 Learning English Steps 1-2-3 includes 83 developmental lessons and practice exercises in the basics of listening, speaking, reading, andwriting in English. Combining colorful computer graphics and proven teaching methods, Learning English Steps 1-2-3 uses real world situations - like conversations in a restaurant, at the bank, at the airport, on the job and more - to help you learn the basics of English. In Step 1 youll start right off with the verb to be and learn to master: pronouns; contractions; questions and answers; time expressions; and more. Then, Step 2 covers: conjugating verbs in the various present, past, and future tenses; making commands and requests; and much more. Finally, Step 3 focuses on using English in the workplace: communication with your coworkers and supervisors; personnel issues; telephone fundamentals; job interviews; raises; promotions; and more. By the time youre finished,you will have learned over 2,000 must-know vocabulary words and everyday idioms! In this one-of-a-kind program, your instructor, Dr. WilliamJex, Director of the American Language Institute at NYU, gives you asolid background in American English, so you can start using it rightaway - at home, at school, and at work.